Leamaneh Castle is located near the sister villages of Corofin and Kilfenora in County Clare, Munster Province. Located on the western coast of Central Ireland, this Castle is well worth the trip for history or architecture enthusiasts. From Dublin Airport, the car ride will be between two and three hours via the M4, the M6 and then the N66 through a small village until the castle ruins, as well as its new structure, loom up ahead. 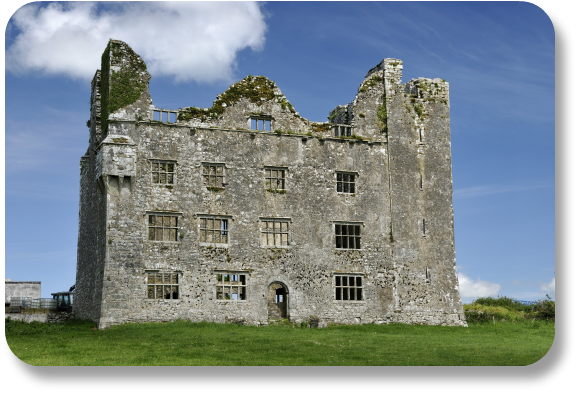 Leamaneh Castle is technically two distinct buildings that stand side-by-side between the villages of Corofin and Kilfenora in County Clare. The older of the two buildings was constructed in the 15th century, and it is a rectangular tower house. Nearly 200 years later, the second building, known as the mansion, was erected. The female owner, Máire ní Mahon, famously married an English solider just to avoid losing her land in the war against Cromwell. Today, the older structure stands, albeit in ruin, while the newer manor home only has its four exterior walls in place. Leamaneh Castle comes from the Irish phrase léim an éich. Translated into English, that means the horse's leap. The two parts of the Castle couldn't be more different. The older of the two, the 15th century tower, has small slits for windows and small doors that were probably only meant for servants. This tower was built by Toirdelbhach Donn MacTadhg Ó Briain, King of Thomond. He was one of the High Kings of Ireland, but he surrendered his crown to Henry VIII and was instead made an earl. In stark contrast is the 17th century manor house next door, which is still part of the Castle complex. The newer part of this duo is four stories tall with gables and rows of transomed windows. This manor house was built for Máire ní Mahon, a powerful woman known as Red Mary. She regularly accompanied her husband on raids against the English settlers in the region. By the 18th century, both parts of Leamaneh Castle were in ruin. Bits of the castle were moved to other places around Ireland. The gates of Leamaneh were removed and taken to Dromoland Castle in 1906, and they are still there. One of the Castle's fireplaces was removed and taken to the Old Ground Hotel in Ennis. The manor house boasts an interesting visual effect, known as Trompe-l'œil. This trick of the eyes uses smaller windows at the top of the building to make the entire thing look taller from the ground. Currently, it is not possible or safe to tour the ruins. However, you can admire the castle from the exterior and take photos. The castle is well worth a visit. If you're in the area, spend an extra 25 minutes driving to see the famed Cliffs of Moher. You can find more information on this terrific Irish landmark here.